For some, the intellectual preoccupation with historical conflict and the events that drive and surround it are immutable. And if you’re anything like me, you find the history of World War 2 the most fascinating. 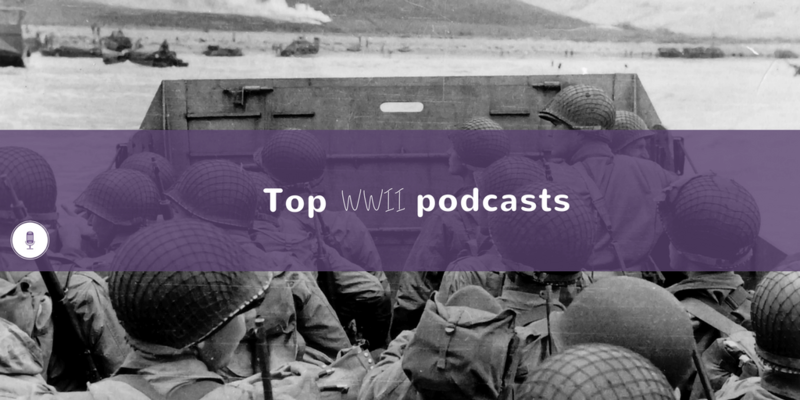 This list counts down the top 8 World War 2 podcasts and is perfect for anyone wanting to spark or consolidate their interest and knowledge of one of the most turbulent periods in world history. 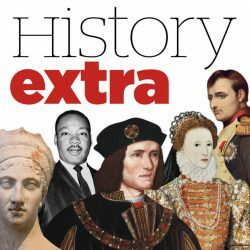 A product of the BBC, the History Extra podcast is a bi-weekly general history podcast profiling interviews with historians and figures through history. While it’s not strictly a World War II podcast, there are several episodes dedicated to the events of the 1930s and ‘40s. Memories of Churchill and the history of the individual. Viking treasures and Hitler’s ‘perfect woman’. D-Day and the Wars of the Roses. The World War Two French resistance and British holidays. Germany through the centuries and Hitler’s cocaine habit. Student radicals and Crete in WWII. Stalin’s early years and Mein Kampf. The Battle of the Bulge and children of the Holocaust. World War Two spies and an extraordinary naturalist. Britain’s Second World War and the Country House. The wartime SAS and Hitler’s drug addiction. The attack on Pearl Harbor and physics through the ages. History Extra comes in at number 8 as one of our top world war 2 podcasts. Heard this podcast before? Leave it a review. 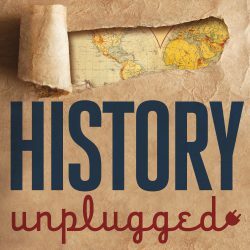 The History Unplugged Podcast is not exclusively a WWII podcast and, as its full title suggests, covers everything from the American Civil War to the history of the Roman Empire. But over the course of its 200+ episodes, host and historian Scott Rank delves into several topics from the Second World War. Who Was WW2 Spy Zig-Zag? Was Hitler a Christian, Atheist, or Something Else? Curtis Lemay: World War II’s Greatest Hero or Worst War Criminal? What if the Nazis Had Won World War Two? What if Japan Hadn’t Surrendered After Nagasaki? History Unplugged Podcast comes in at number 7 as one of our top world war 2 podcasts. Heard this podcast before? Leave it a review. Jim Leavelle witnessed the bombing of Pearl Harbour from the USS Whitney and was one of the homicide detectives who investigated the assassination of JFK. Captain Jerry Yellin flew P-40s, P-47s and P-51s as part of the 78th Fighter Squadron and has the legacy of flying with the first and last combat missions over Japan during WWII. Lt. Col. Alfred Shehab joined the 38th Cavalry Squadron on a reconnaissance mission in the Ardennes region when the Battle of the Bulge broke out on December 16, 1944. John Weston joined the 758th Tank Battalion, the country’s first ever African-American armored unit. 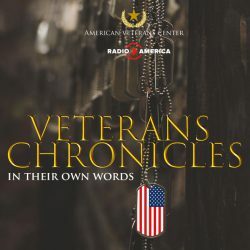 Veterans Chronicles is a podcast dedicated to the men and women who have served on behalf of the US over the last century. Filled with insightful interviews with those who were involved in all of the wars during that time, not just WWII, the show is a must-listen for anyone who wants a deeper insight into the perils of war, from those who know them best. Veterans Chronicles comes in at number 6 as one of our top world war 2 podcasts. Heard this podcast before? Leave it a review. It’s unfortunate that the War And Words podcast only lasted seven episodes, such was its early promise. Hosted by Jonathan Dimbleby, what’s unique and wonderful about the show is its heavy use of historical news clips from the period, something the BBC no doubt has easy access to. Interspersed with the clips is Dimbleby’s commentary, which ties each episode together and gives them pace and focus. While War and Wordsisn’t a comprehensive coverage of the Second World War, the seven episodes span some of the more notable events, including the Spanish Civil War, The Phoney War, Dunkirk, D-Day, the liberation of Paris, and the bombing of Hiroshima. 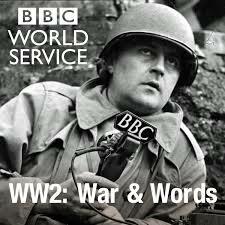 War And Words comes in at number 5 as one of our top world war 2 podcasts. Heard this podcast before? Leave it a review. 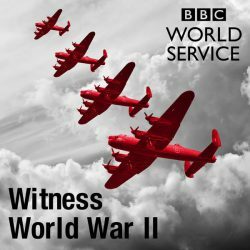 As is sometimes the case with podcasts produced by the BBC, Witness World War 2 is a little less than captivating. Following the broadcaster’s age-old podcasting model, to inform first and entertain second, the show lends itself to those with a serious interest in the Second World War and is not for the fickle history prospector. If you happen to fit into that first category of listener, and your ears can accommodate the quaint British narration, then you’ll enjoy this one. The podcast itself has been in circulation since 2010 and has since been responsible for more than 100 episodes, spanning the events of Pearl Harbour, the siege of Leningrad, the Retreat from Dunkirk and the fall of Berlin. The host’s narration is cut with snippets of interviews and other historical audio, which gives each episode a rich authenticity that isn’t replicated as well by other shows in the genre. Witness World War 2 comes in at number 4 as one of our top world war 2 podcasts. Heard this podcast before? Leave it a review. Belton Cooper and Bertrand Close, veterans from the 3rd Armored Division, describe their race across Europe in their M4 Sherman tank. Clarence “Bud” Anderson and Francis “Gabby” Gabreski reminisce over their roles as fighter aces who defended the European skies from the German fighters. Robert Weiss, a US Army forward observer, tells of his perilous role in the conflict, to surge ahead of his fellow troops to find enemy artillery targets. Warriors In Their Own Words tells some of the most important stories from the Second World War in the words of those closest to the events. Whether you’re a newcomer to WWII history or a long-time devotee, you’ll devour this series of riveting and real retellings of the conflict that defined the middle part of the twentieth century. 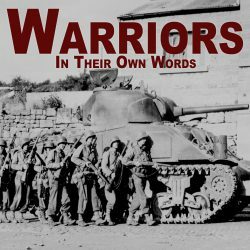 Warriors In Their Own Words comes in at number 3 as one of our top world war 2 podcasts. Heard this podcast before? Leave it a review. 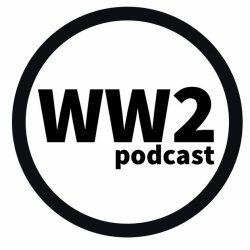 The WW2 Podcast is dedicated to the military history of the Second World War. Hosted by a British host, Angus Wallace, the show launched back in 2015 and has gone on to release more than 65 episodes. Throughout the ongoing series, Wallace has covered a range of WWII topics, from Churchill’s decision to join the war in 1940, to the famed Nazi Hunters, to the Normandy landings. Wallace reinforces his episodes with interviews of authors and military experts, who help to paint in the finer details of the events, battles and people that contributed to the war. WW2 Podcast comes in at number 2 as one of our top world war 2 podcasts. Heard this podcast before? Leave it a review. When looking for the ultimate podcast about the Second World War, you need go no further than The History of WWII Podcast. 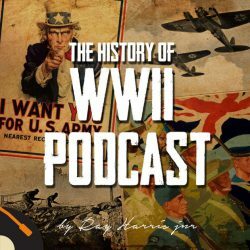 American host, Ray Harris Jr, has been releasing episodes for the show since 2011 and has covered in brilliant audio detail every aspect of the period leading up to the war and the war years. With a worldview, Harris takes the time to set the stage for every major player involved in the conflict (including Germany, France, Britain, America, Japan, China, Italy, and Russia) and informs the series with profiles of the leaders that ruled the period (Mussolini, Stalin, Hitler, Churchill, Roosevelt). What sets Harris’ work apart from any other is his storytelling attention to detail — he doesn’t breeze past the lead up or gloss over the critical events that contributed to the conflict and its resolution. You won’t be disappointed. The History of WWII Podcast comes in at number 1 as one of our top World War 2 podcasts. Heard this podcast before? Leave it a review.